Casa Rural Rancho Calvillo is located at the entrance of the Natural Park, being the ideal place to get to know the mountains, as it is very close to Grazalema, El Bosque and the other towns of the Park. The house is a typical Andalusian farmhouse, fully equipped, respecting the walls and distribution, which is why it is very cozy, since having wide walls the temperature is always very pleasant. The house is located on a property of our property and there are no neighbors, so it is perfect for people who want tranquility. In addition, it has a swimming pool to spend the summer months. It is surrounded by cork oaks and oaks where we raise our own Iberian pigs, and with the slaughter we elaborate the chacina and the ham. There is an Arab stone oven where we make bread and sweets, besides having chickens and a small garden. My father has the habit of welcoming our customers with some of these products. 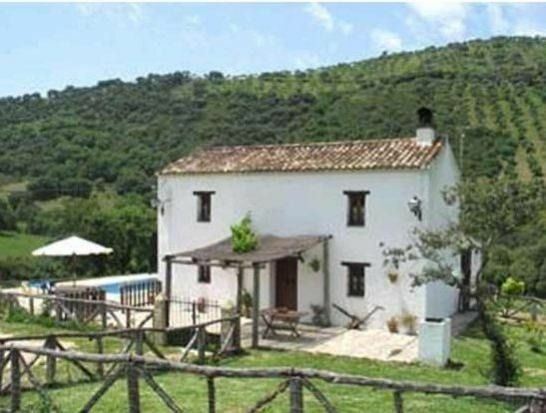 Casa Rural Rancho Calvillo has the Quality Mark "Natural Park of Andalusia". Our house has been selected as an Information Point of the European Charter for Sustainable Tourism of the Sierra de Grazalema Natural Park. Also, if you ask for it in advance, we can arrange with the Central Reservation of the Natural Park (located 200 meters from our hotel), the necessary permits to access those trails for public use that need authorization. You can also stay at Hotel Rural Enrique Calvillo.